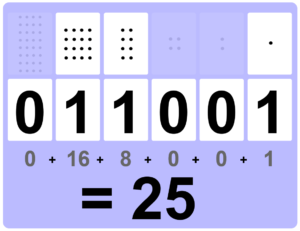 Discover how binary numbers are made using this interactive board. Click on the white number cards to show either 0 or 1. This automatically reveals the dot cards as well as changing the calculation and total value at the bottom. Very clear visual representation of how binary numbers are constructed.